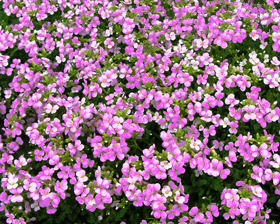 Arabis Pink Blush is a dwarf, mat-forming evergreen perennial with soft deep green leaves that form ground-hugging rosettes. Masses of bright clusters of rosy-pink flowers are borne on short stems from April into summer. A well grown specimen can be covered in hundreds of flowers which are sweetly scented and long-lasting. 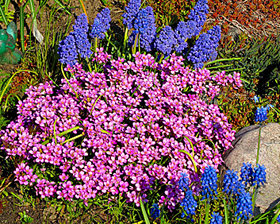 Perfect for rock garden or for trailing over the edges of containers, over stones or down walls.